Haze Hovers Over Delhi, Air Quality Slumps To "Severe"
To curb pollution levels around Diwali, the Supreme Court this month only allowed the use of "green" firecrackers, but it was unclear how the rule would be enforced. Like last winter, many parents in Delhi plan to send their children out of the city. Delhi was covered in a blanket of choking grey air and pollution on Saturday, with government data showing air quality slumping to "severe" or "very poor" levels in almost all parts of Delhi. Authorities have already advised residents to keep outdoor activity to a minimum from the beginning of next month until at least the end of Diwali on November 7, when firecrackers typically further taint air already hit by the burning of crop stubble in neighbouring states. 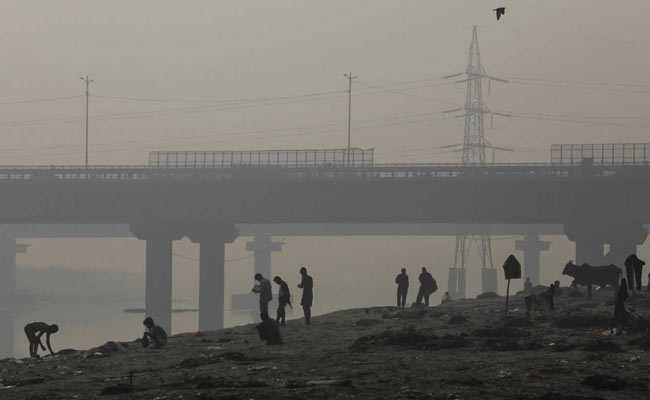 According to the Central Pollution Control Board (CPCB), 25 out of 31 monitoring stations in various localities of Delhi for which data was available on Saturday showed that the air quality in those areas could "seriously impact" the health of sick people and affect even those without any respiratory illness. The rest of the five monitoring stations showed "poor" air quality, which the CPCB says can cause breathing discomfort to most people on prolonged exposure. "We have been stripped of our #RightToBreathe," DelhiPollution, an online forum to engage people on pollution in Delhi, said on Twitter. Some doctors in the capital said they had already begun to witness a surge in patients with respiratory problems. Prashant Saxena, head pulmonologist at the Max Smart Super Speciality Hospital in New Delhi, said the number of patients coming to him with breathing problems, asthma, chest and related ailments has increased 15-20 percent in the past two weeks. "I am expecting it to rise further, because the air quality is worsening and pollution is an ever increasing problem here," he said. "I am getting a lot of people who are not getting relief easily. They require medication for longer." Despite pressure from health experts, the government this year held off on a wholesale ban on fireworks and has faced criticism for failing to prevent farmers in states neighbouring Delhi from burning stubble. To curb pollution levels around Diwali, the Supreme Court this month only allowed the use of "green" firecrackers, but it was unclear how the rule would be enforced or whether there was such a thing as an environmentally safe firework. Environmentalists have also questioned the credibility of the central government's target to reduce stubble burning by 70 per cent in neighbouring Punjab and Haryana states this year.